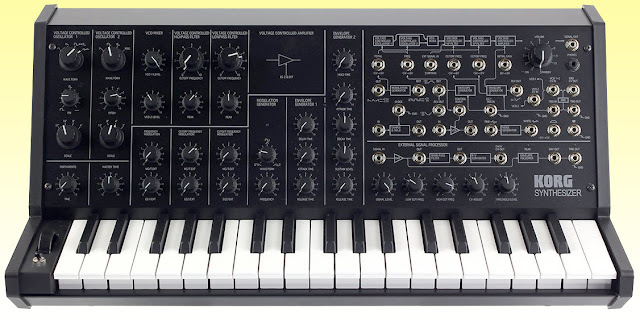 I've owned an MS-20 Mini by Korg for almost two years now... and I love it, but for some reason I have never written about it on my blog before. For this post I want to share just a handful of patches for this 100% analog recreation of the classic synth. I have used this synth in the context of a live gig and in various different setups but it's also fun just creating patches for the sheer fun of it and in order to explore the possibilities of the machine. I will go through each section of the synth, if a section is missing that suggests that it is to be left in its neutral position. For instance, if portamento isn't mentioned assume that it is at 0, if EG2 isn't mentioned assume it has full sustain with no hold, attack or release. With this patch I was trying to emulate the bass synth sounds found in a demo version of the song Cold War by the band Devo. I think I came fairly close. Here the first EG is used to add some movement to the sound when a note is held down. The sound is warm and deep with a snappyness to it thanks to both EG's having no release and the sustain being brought down and the decay kept nice and tight on EG2. This patch was made to be used in a live improvised setting where the focus would be on texture and weight of the sound as well as being able to quickly change the sound on the fly. The recording above uses the patch without either oscillator and very sparring use of the EG1 patch. I was mainly using the pink noise patch for this track. The idea of the patch is that it allows a lot of freedom and has a lot of creative and textural potential. The EG1 patches create an unusual and incredibly variable modulation source for pitch, HPF and LPF. Basically the EG1 is looped back on itself and repeats constantly, depending on the turning of the EG1 knobs you can get some incredibly long or short variants in sound colour and texture. Easily one of my favorite modulation sources. The EG2 Rev patch means that whatever note you last play will be held until you press another one. The Sample & Hold patch adds an additional rhythmic element through effecting the LPF which can be very nice when used sparringly. If you have the Peak up high on the LPF you get some lovely popping sounds. The Pink Noise is basically used as a sound source but goes through the ESP first as this allows it to be overdriven which creates some great broken up popping sounds and the Bandpass Filter allows the sound to be sculpted before it enters the signal in. The Doom patch I made is fairly simple and doesn't use any patch cables. The idea with this patch is to create thick heavy distorted sounds that fade slowly like a slow Doom/Sludge Metal riff. A fun patch to play around with but one I haven't used for anything yet. One of the sounds you are going to come across by accident when messing around with the MS-20's modulation generator is a helicopter sound. One way to get that true helicopter sound is to use the MG to gate the playing of the synth so you get that choppy gated sound. With this patch you can change the speed of the MG to increase the propeller speed and decrease the LPF Total to create a quieter sound to give the impression of moving through space. The idea of this patch was to create a 'one shot' style sound where no matter how long you hit or hold the note you get a similar length sound, a short punchy sound. This was one of my first patches and I wanted to use the switch on the synth as it seemed so novel and unusual to me that a synth should have a switch. I used this switch to add brightness to the sound so that when the button is held the LPF cutoff is increased giving a much brighter sound, when you release the button it slowly goes back to its original state. In this patch we have the two filters moving in opposite directions at different times. LPF is linked to EG-1 whereas HPF is connected to EG-2. You can get different sounds depending on how long you hold the note. I was surprised how good the MS-20 was at doing vocal like sounds but the dual filter really helps this. One thing that is interesting is how quickly the vocal sound can be perceived and also lost through tinkering with the patch. If you move the cutoff or the peak of either filter it's very easy to lose the sense of the voice. This is just a fun little patch but the results can be impressive from a technical point... at least it impresses me... yo yo! Here comes a new challenger! An additional patch for those in need of a super move. This is another 'one shot' style patch where no matter whether you hold a key or press it for a split second the results are the same (a.k.a. equal decay and release). This is a fairly basic sound for the MS-20, it doesn't use any of the patch cables but I have sculpted the patch in such a way that it doesn't sound too overblown and is clear but still heavy and thick. Most of the thickness of the sound comes from the Ring of VCO-2. I have set it 7 notes higher than VCO-1. I don't have any musical training but the notes seem to resonate really nicely at this point and once in Ring mode it brings a lot of nice character to the sound.